Straight sided cylinder with an applied molded handle; sign language alphabet printed in black. 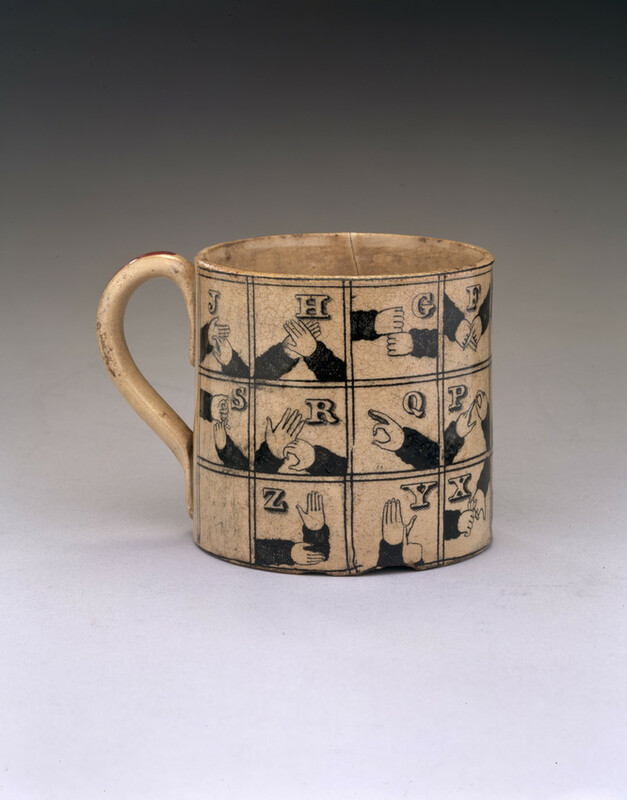 "Cherished Possessions": This mug belonged to Charles Barrett, who lost his hearing as a child and was one of the first students at the American Asylum for the Deaf and Dumb. Founded in Hartford, Connecticut, in 1817, the asylum was the nation's first school for students with any type of disability. The prospect for hearing-impaired children at the beginning of the nineteenth century was grim. Sign language was still unknown in this country, and a child's only hope for communication was through signs and gestures developed within the family. Under the leadership of Thomas Hopkins Gallaudet, the Hartford asylum established a language of signs, adapted from the French, that was to become American Sign Language, recognized today as a distinct language spoken by between 500,000 and two million Americans. Co-publisher: Society for the Preservation of New England Antiquities.